Russian government rabbi and author; born at Wilna in 1835; died at Riga April 26, 1893. He graduated from the rabbinical school of Wilna in 1859 and edited, in conjunction with Asher Wohl, the Russian supplement to "Ha-Karmel" (1860-61). In 1861 Pumpianski was chosen government rabbi of Ponevezh, government of Kovno, where he remained until 1873; he was then elected to the same office in the Jewish community of Riga, remaining there until his death. Pumpianski was the author of a collection of sermons in the Russian language which he delivered in Ponevezh (Riga, 1870); a new edition of the Psalms with a Russian translation and a Neo-Hebrew commentary (Warsaw, 1871); "Solomon Premudroi" (Riga, 1882); a Russian drama which he published under the pseudonym "I. Heiman"; "Shire Ẓiyyon," Hebrew poetry, of which the latter part contains translations from Russian poets. He also edited a monthly magazine, "Yevreiskiya Zapiski," of which twelve numbers appeared in Riga in 1881. 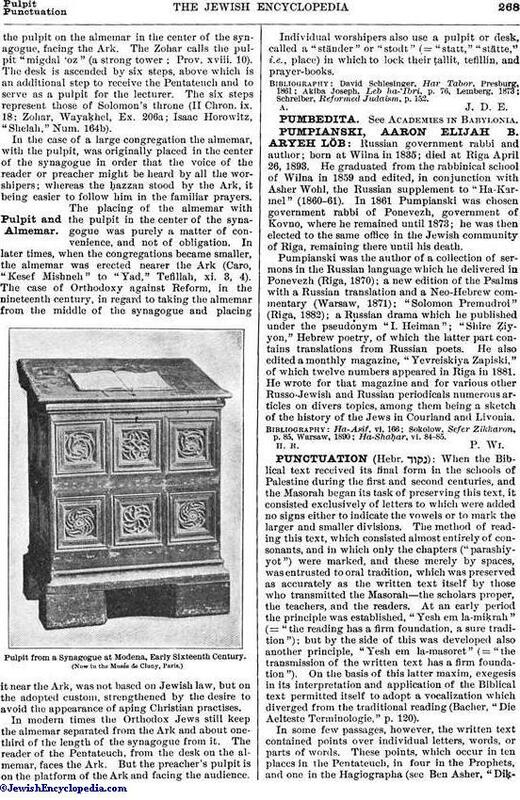 He wrote for that magazine and for various other Russo-Jewish and Russian periodicals numerous articles on divers topics, among them being a sketch of the history of the Jews in Courland and Livonia.